Cellist Matt Haimovitz brought a unique concert-going experience to Hamilton and Clinton on Nov. 6 – a moveable feast of Bach’s Suites for Unaccompanied Cello. He performed at the Taylor Science Atrium, the Howard Diner and the Kirkland Town Library and then presented a concert in Wellin Hall on Saturday evening. Renowned as a musical pioneer, Haimovitz made his debut in 1984, at the age of 13, as soloist with Zubin Mehta and the Israel Philharmonic. 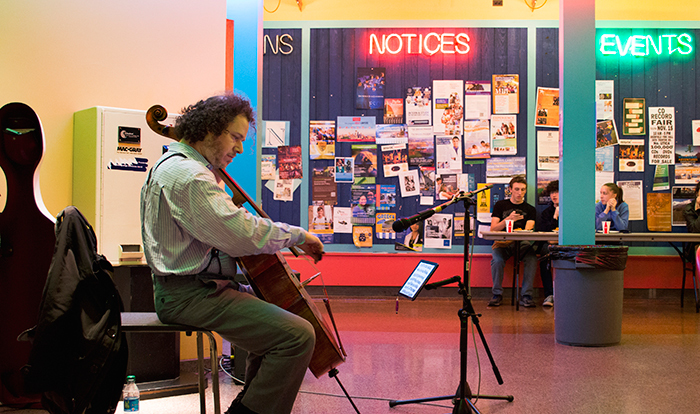 The solo cello recital is a Haimovitz trademark, both inside and outside the concert hall.